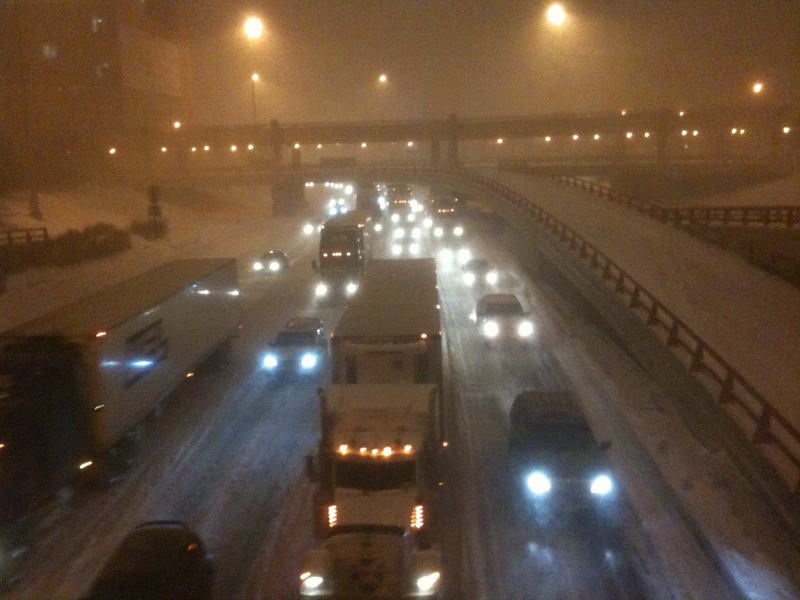 On Tuesday, Chicago was facing what the broadcasters were calling the biggest snow storm since 1967. Bryan and I both got to leave work early due to the weather - AND we both got snow days on Wednesday. By about 3pm, I was just finishing up at work and the snow was coming down pretty hard, and I was extremely grateful that Bryan was already home and I only had to walk 5 blocks home. I've survived many blizzards in multiple parts of the country, and I love getting to hunker down in my sweatpants, with hot drinks, comfort food and a movie. We were pretty excited to have a chill evening at home, not having to worry about the weather. Then, I realized that it is extremely rare to see downtown Chicago be completely deserted and I suggested to Bryan that we put our boots on and traipse around in the blizzard tonight! We are so lucky that the weather doesn't really affect us. We live in a condo building, so we don't have to shovel our sidewalks or driveway. We have underground parking, so we don't have to dig out our car. We just get to be kids and actually enjoy the snow! We decided that we had to take this opportunity to embrace the blizzard. While reading news articles online, learning about the storm that was hitting the city, I came across a news article that piqued my interest. 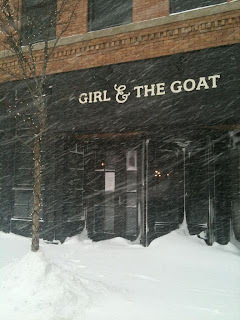 Girl & the Goat, a restaurant near us that we've been trying to get reservations at for MONTHS, announced that it was going to stay open despite the weather. Additionally, they noted that a lot of their reservations were cancelling and they were welcoming walk-ins! 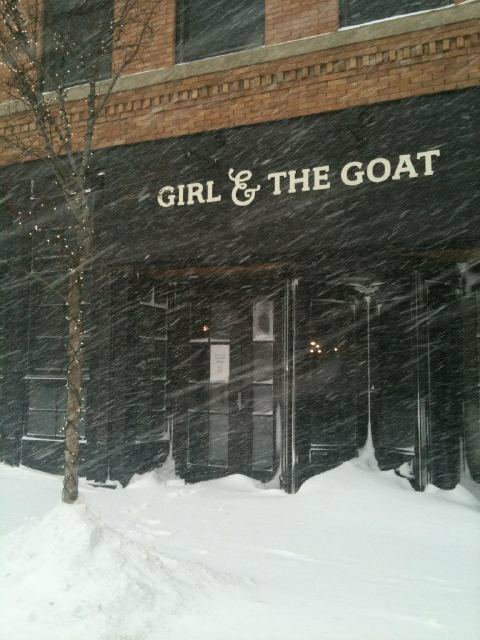 I mentioned to Bryan that while we were traipsing about in the blizzard, maybe we could make our way over to Girl & the Goat. He was immediately convinced, and I was super pumped! Impromptu date night!!! We got bundled up and put on our Sorels, and headed out into the storm. We saw some people in the hallway of our building, who thought we were crazy. The guy at our security desk also thought we were out of our minds. After surviving multiple winters in the winter tundra that is Minnesota, this just seemed like a normal snow storm. No big deal! Once we walked outside, we were in awe! There was already close to a foot of snow on the ground, and it was coming down like crazy! All the downtown streets were completely empty. There were only a few people out on the sidewalks, and they were shoveling. We did not see many people at all, and the ones we did see were not just walking around for fun like we were. WE LOVED IT! This is overlooking 90/94W, zero traffic. I have never seen this before! 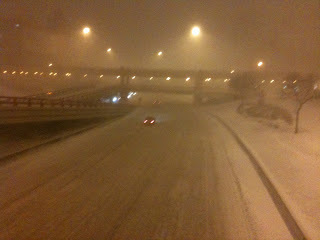 This is overlooking 90/94E, traffic barely moving. I see this all the time. However, we heard on the news later that people were stuck on the roads for 3-4+ hours. They actually closed Lake Shore Drive later in the evening after people hadn't moved in over 2 hours. The streets were practically deserted. We made it the 5 blocks to the restaurant, and were seated on the spot! It actually became pretty crowded while we were there! The way the restaurant is laid out is awesome. It is very open with exposed brick. The kitchen is along the back wall, and is open to the whole restaurant. It wasn't very loud, so that we were able to have a conversation at ease, and we even were sitting very near the kitchen. The dishes are small plates, made to share. You choose from vegetable, fish or meat dishes. Basically, you just eat and order, eat and order. They also have the most amazing breads, of which new flavors are made fresh daily. We tried a "soup" bread. It actually tasted like we were eating soup! The bread was broccoli and cheddar, and there was cream of mushroom butter and tomato basil olive oil for dipping. It was seriously so good!! We also ordered a chickpea fritter, which was basically chickpeas done three ways topped with romesco, hazelnut hummus and goat feta. MMM! We also ordered seared scallops with goat sausage, shrimp, shiitakes, and winter squash. Delicious!!! For our meat, we had goat, pork and veal sugo wrapped in Pappardelle pasta with rosemary and cape goose berries. The goose berries totally made this dish out of this world!!! I cannot wait to go back and try more delicious dishes! Thanks for staying open during the storm Girl & the Goat!!! I'm glad you and Bryan had a few days off from work and got to enjoy some great food! YUmmmm Girl and the Goat. We must have been lucky, we walked in one night and after noshing at the bar got a table about 25 minutes later. The sugo was good, agreed! Good use of thundersnow time!